New York Yankees Gary Sanchez has hit 19 home runs quicker than any player in MLB history, and we’re not even finished with it yet. 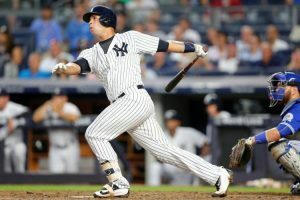 The star player has only been playing the sport in the big leagues since 2015, which means that fans can look to many more years of his fantastic hitting skills. Sanchez currently has a total of 19 home runs so far this year, which has surpassed Wally Berger’s previous record of 17. The Santo Domingo native first signed with the Yankees in 2009 as an international free agent, but didn’t make his official MLB debut until October 3, 2015. Over the sea years that he spent on Class AA teams, Sanchez continued to grow and make a very reputable name for himself as a catcher. That fall, he was the AFL home run leader and was even named the Fall Stars Game Most Valuable Player and the second best prospective player in the AFL by Baseball America. Sanchez hit the charts this week by making history with his 19th home run for the season, more than any other player has ever before. The 23-year old has a lot to look forward to in the future of his career, and so do his fans. If your company is interested in finding out availability and booking fees for a baseball player like Gary Sanchez or other celebrities for an Product Promotion, Baseball Camp, Fundraiser, or Personal Appearance, call us at 1-888-246-7141.